Excited (botanical) chatter, the inexorable flashing of camera equipment, intrigued visitors gathering around our new gallery space; this was our Virtual Flora of Tullie Herbarium Project, funded by the Bill Pettit Memorial Award at the start of 2017. The scope of the project, between 30th of May to 26th of September 2017, was to use a team of volunteers to begin photographing and cataloguing our (“ex”) University of Lancaster herbarium. This significant acquisition of 35,000 vascular plant sheets is a highly data rich and well-provenanced collection with invaluable information on the historical and contemporary distribution of species across the UK and beyond. Almost a third of the specimens were collected from Cumbria, much of it collected during a major 30 year survey of the flora of Cumbria; an exemplar model of field surveying which is aspired to by Botanical Society of Britain and Ireland (BSBI) recorders today. The survey work culminated in the team leader’s (Geoffrey Halliday) highly comprehensive publication of A Flora of Cumbria. 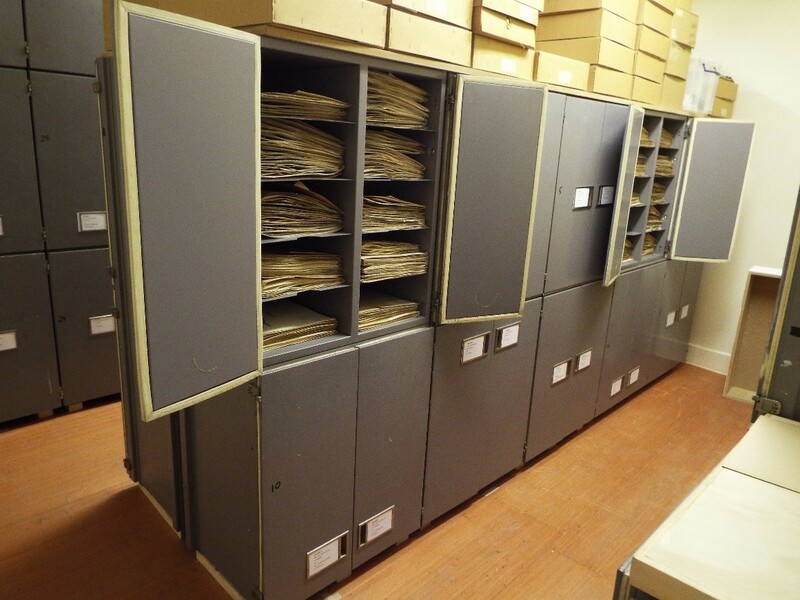 No other herbarium has a comparable recent (1968+) collection of Cumbrian material. But despite the importance of this recent acquisition, none of these specimens were digitised. Thanks to the Bill Pettit Memorial Award funding this was all about to change. The inside of the (“ex”) Lancaster herbarium, showing specimens stacked and arranged taxonomically. (C) Tullie House. The Award funded the Assistant Curator, Claire Sleightholm, to supervise a team of four volunteers over 90 hours over 17 weeks (plus a few hours for image processing). The scope of the funding allowed us to digitise the entire collection of Salicaceae, which includes the willows, which were of the perfect collection size (821 sheets) to digitise within the scope of the project. The project transformed a previously quiet gallery space into an exciting, buzzing collections workspace where, most importantly, volunteers could interact with the general public. The four volunteers, Tracy Perfect Reid, Annwen Philipson, Annie Donnelly, and Louise Ceres, worked in pairs under the supervision of the Assistant Curator. Specialist groups such as the Cumbria Botany Group, cannot be underestimated here in their value as recruitment sources. As Claire keenly set up the DSLR camera, synced to 2 studio flash units, the volunteers eagerly sat down in their new collections space. The volunteers methodically worked through one herbarium sheet at a time, ensuring that each one had its own separate entry on our collections management system, MODES. As each sheet was catalogued, and separately accessioned, it was then photographed. The herbarium set up in the newly designated collection space; showing volunteers working on documentation and photography. (C) Tullie House. 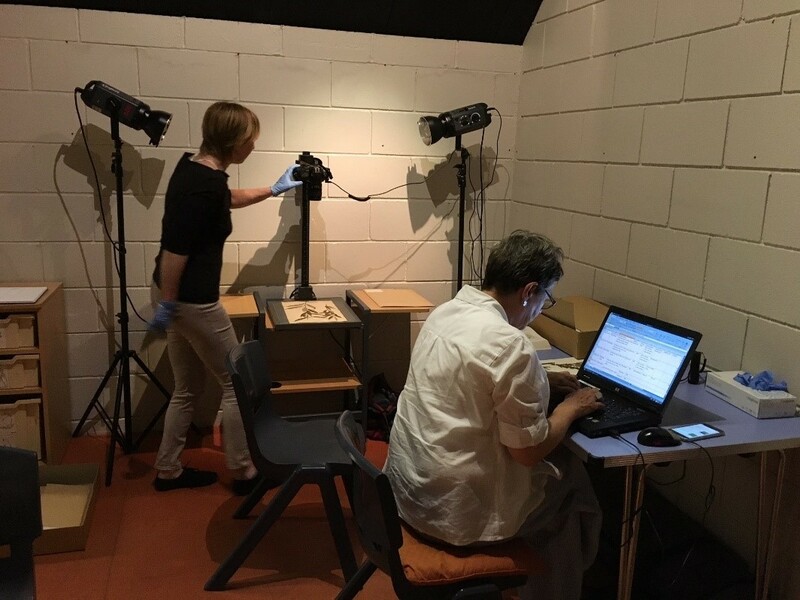 However, we learnt during the course of this project that this systematic method of cataloguing and photographing each sheet was a very time-consuming process. About halfway through the project, upon reviewing our progress, we decided that we needed to make things more efficient; separating out the processes into photography and documentation. The volunteers took heart. Not only could they be more efficient (averaging 4 minutes or less for the digitisation of each sheet), but we could match their skills and strengths more effectively to each task. The quality of the images also increased with this division of labour; the images were highly susceptible to inadequate lighting, or even the occasional hand or finger creeping in. As it took at least 3 minutes of the Assistant Curator’s time to process each image, including cropping, and adjusting lighting and colour balance, it is worth trying to get pictures right the first time round. Volunteers found they could photograph with more care and precision, working in batches. The relatively simple process also made it easier for volunteers to speak with visitors in the gallery. During the summer holidays, the volunteers engaged with many visitors: more than 37 adults and 27 children. Digitised specimen of Salix fragilis (Crack Willow) from south of Cockermouth (Cumbria). (C) Tullie House. The second part of the project, was to upload the images onto the crowd-sourcing website, herbaria@home so that an active online community of botanists would fully transcribe the labels into the database. The data would then be available for all to see, whilst it is continually “cleaned” and improved by online volunteers. Although we are still waiting for our images to be uploaded onto herbaria@home, the basic MODES records we have completed (with basic what, who, where and when data) will go to our Cumbria Biodiversity Data Centre and will then be globally available through the National Biodiversity Network Atlas. 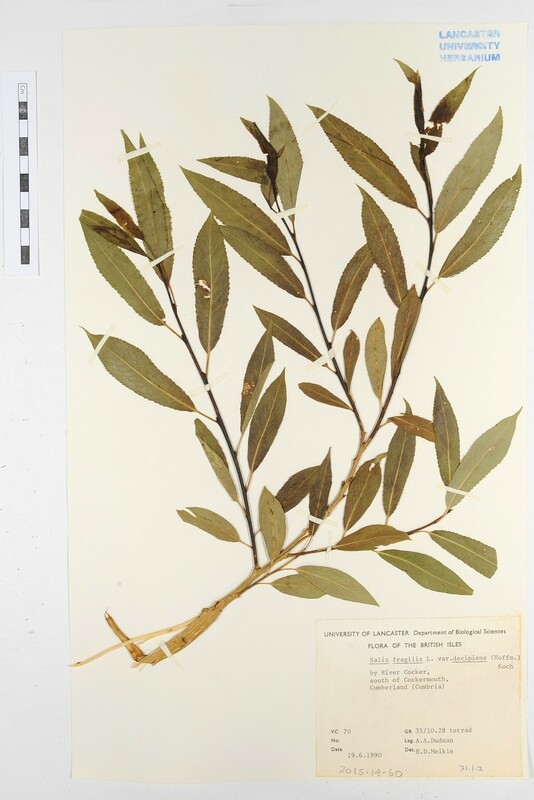 We hope that this data, and the more detailed herbaria@home records, will both raise the profile of the collection whilst contributing to species distribution data (for instance, the Dwarf Willow). A key aim of the project was to develop a self-sustainable team of skilled volunteers who are able to work with less staff supervision and greater efficiency. We have two volunteers, botanical enthusiasts, who are able to continue with the project. We would like to thank NatSCA for providing this fantastic opportunity to start digitising this nationally significant herbarium. “I consider myself very fortunate to have been able to take part in it and to work alongside some very lovely people” Louise Ceres. “Yes I would be interested in carrying on with the project and doing everything” Annie Donnelly. Written by Simon Jackson, Tullie House Curator.